his last words to his disciple Ananda in the Mahaparinirvana Sutra. yourselves. Look not for refuge to any beside yourself." speaks about being a beacon of self and of being a beacon of the Law. are the guiding lights that illuminate the darkness of life and death. as a human being and to achieve self-realization. universe, expounded the Law and saved human lives. Mahayana Buddhism teaches that many Buddhas have made their advent. death, and from this developed the theory of the Buddha’s three bodies. "manifested body" - became widely revered, the idea of the "bliss body"
or spiritual strength to perceive the truth, developed. Buddhism and has many followers. through the means of his death he can teach and instruct people. in historical reality of the suprahistorical or Original Buddha. says no, then when was he lying, then or now? SGI is not Nichiren Daishonin's Buddhism. Of this there is no doubt! not against their own teacher? Buddhism is a false teaching by traitors." attacked by foreign troops. This is what I predicted in my Rissho ankoku-ron. divine protection? Or, is it because false teachings spread over this land? not. How can these monks chastise great Mongol troops by means of prayer? don't listen to me now. Priest Yadoya, and Saemon-no-jo Taira, so you should get together for consultation. this as a sign for the future movement." sects. Now, Taisekiji invited us to visit inside and outside of various temple buildings. Shonin, and invite Taisekiji to join us." No surprise. Several billion dollars goes a long way to buying respectability. Look at the vendors at Minobu who sell t-shirts with printed Gohonzons for thirty dollars a pop. For several billion dollars, Nichiren Shu will surely accept the selling of a wooden plank with a Gohonzon scratched on it. The whole truth and nothing but the truth so help me God [Ikeda]. Rush Limbaugh, Michael Savage and Wongkc [Soka Gakkai leader], are three peas in a pod. What binds these bastions of freedom together? Their hatred of the media. The mainstream media can not be trusted. The Seikyo Shimbun, on the other hand, the voice of the SGI autocracy, is beyond reproach!!! It is the impartial and unbiased vessel of the Law. You mean like doctored photos of Nichiren Shoshu prelates with geishas in the Seikyo Shimbun? Only the unbiased Snakyo Shimbun and World Tribune can be trusted. Then why didn't the $GI with all their billions win even more suits than Mr. Yew? The SGI would outlaw Newsweek, Time, and Asiaweek as well as CNN and the BBC. What's next, Animal Planet? They should be outlawed for criticizing the SGI. We too should be driven underground like the evil Fujufuse sect. Internal media as a source of unbiased news? Ever hear of the Jewish press criticicizing the Israelis while lauding the arabs? Wong, wake up!!! The BBC documentary quoted Ikeda and Abergate. They don't represent your view? Man, I'm with you Wong. I just canceled my subcriptions to the New York Times, Newsweek and Time magazine, and bought a ten year subcription to the World Tribune and the Seikyo Times. Now, I will get the whole truth and nothing but the truth so help me God [Ikeda]. From the NST Dictionary of Terms and Concepts: "Five senior priests"
"Five of the six senior priests, excluding Nikko Shonin, designated by Nichiren Daishonin as his principle disciples shortly before his death"
Marc's comments: They have to grudgingly acknowledge their appointment because the transfer document referring to the Six Priests still exists and is fully corroborated by historical events. The Six Priests did in fact lead the Sangha after Nichiren's death. "They are Nissho, Nichiro, Niko, Nitcho and Nichiji. While the Daishonin was alive, they devoted themselves earnestly to the propagation of his teachings, but after his death, they refused tofollow Nikko Shonin even though the Daishonin had formally appointed him as his successor"
This is Big Lie Number 1. Nikko was junior in rank within the group. The documents Taisekiji depends on are a "no sale." They are not existent in anything close to an original, and more important, have not the slightest bit of corroboration. Nikko would have showed up in the records and accounts of the time as taking a leading role if they were authentic but he never once did. He didn't even lead Nichiren's funeral but rather marched in the JUNIOR rank. 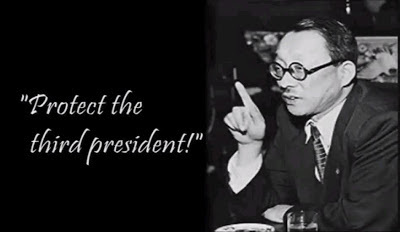 He never once mentioned himself as some sort of spurned leader even though he was off Minobu for 36 years and had every opportunity to do so. Not a single person mentions him as leader nor mentions what would have amounted to a coup de tat in not following him. The claim that Nikko was heir has no standing among historians who know all the details of the matter. "They gradually departed from the orthodoxy if the Daishonin's teachings, compromising with sects which he had considered heretical and neglecting the strict spirit of shakabuku"
Here we find the slander that they went over to other sects. In the individual bio's, this NST Dictionary names the Tendai Shu. This is untrue and hypocritical. Nissho, the leader of the group as it's most senior Priest, reissued the Rissho Ankoku Ron which excoriates the other sects in direct uncompromising terms, at great peril to his life. Hardly the act of a compromiser. It was Taisekiji who in later years sent their priests to Mt. Hiei, the home base of the Tendai, for instruction and to get magical Tendai transmissions. As far as "neglecting Shakabuku" goes, Taisekiji failed to thrive and remained for centuries an extremely small clan temple. The Temples of the remaining Senior Priests grew at rates 10,000 times greater than Taisekiji, putting the lie to the NST slander that they other priests "neglected Shakabuku." Daishonin as the Buddha of the Latter Day of the law"
And neither did Nikko. The "Nichiren as Eternal Buddha" heresy crept into Taisekiji dogma centuries later and is a backslide into common Japanese Founder Worship. "....and simply regarded him as a follower of Tendai Buddhism." "Consequently they did not appreciate the significance of the Gohonzon which he had inscribed as the object of worship, discarding it ni favor of images of Shakyamuni"
The preference by this or that group for the Paper Gohonzon or the Statue arrangement Gohonzon developed later mostly as a response to persecution (you can run out the back door with the Paper Gohonzon much easier than with a heavy statue). Nichiren himself used a statue as his personal Gohonzon. Nikko complained bitterly when he did not get it after Nichiren's death. This is just a sloppy backhanded insult tossed out by NST, secure in the knowledge that their members are neither inquisitive nor able to get good information about complicated issues. "Mounting this jeweled vehicle, they directly arrive at the place of enlightenment." the bonds of mortal life." and others gain their opportunity." from chanting. They use their own viewpoint that the "state of mind"
doubt their "state of mind". As the Nike commercial says, "Just do it!" leader of kosen-rufu, directs us toward the Dai-Gohonzon." the true aspect of the eye opening of wooden and painted images? he Buddha of beginningless time, is the most fundamental one." sect is sliding irrevocably down the "path to ruin." I want to make this perfectly clear to you all." enlightenment exactly as it is with nothing lacking during 64 transmissions. heritage of the True Law. We take no part in this. power of evil spirits. That is why they are dangerous." Former SGI president, Josei Toda, Daibyaku Renge, 98, p. 98.
chant are identical to the practice we observe. it would be useless to embrace the Lotus Sutra." "
lifeblood of faith. We must clearly differentiate between the two. defending and advancing the Daishonin's Buddhism." high priest is the fundamental spirit of the Gakkai." mistaken about this single point, then everything will become insane." "the two indivisible entities of the Object of Worship,"
inherited the Law. Now he is the master of true Buddhism." avoid the criticism of future generations that our Kosen-rufu was a sham." "That which forms the basis of Nichiren Shoshu is the Lifeblood. alone recieve and inherit this Lifeblood, and preserve it eternally." Gakkai. Only the Soka Gakkai possesses "action"
cowardice, timidity and ignorance of those disciples as "pitiful." be said to be the treasure of the priest"
Daishonin individually represent the treasure of the priest"
all individually represent the treasure of the priest"
Shoshu, let us firmly establish a religion for human beings..."
Fusing with the object of worship of the sleazy conman Nichiu, of the bizarre slanderous priest Nichikan, or of the Enlightened Supreme Votary of the Lotus Sutra Nichiren? Realizing that one takes on the characteristics of their respective object of worship, this is a no brainer. Lest we get too clever in tossing about words like "gohonzon" or "buddha", let's keep in mind the essential reality that NO ONE (not any high priest or scholar, or the people who read this blog) has a clue what a "gohonzon" or a "buddha" really is. We have Nichiren's word that the "gohonzon" is the ongoing "ceremony in the air" and we have Shakyamuni's word that "only a buddha and a buddha" can know the ultimate reality that the gohonzon embodies. It is a mystery. The absolute mystery. A plant follows the course of the sun daily. Animals follow the biological clocks of the movement of stars. Neither plants nor animals "understand" why they follow these "laws" or what the stars and the sun mean. Likewise, we "follow" the Law and we respond to inherent Buddhahood, but we haven't a clue about this ultimate reality. So, it's superficial speculation to say that the gohonzon is only a representation of the Eternal Buddha but is not the Eternal Buddha in actuality. If Nichiren says that a gohonzon which has had its "eyes opened" to the Lotus Sutra is imbued with the "soul" (tamashii) of the Eternal Buddha, then it is foolish to determine that the gohonzon is merely a "representation" and piece of paper. That's relying on our human senses to imply "value" or "reality". Our human senses cannot gauge reality at all, according to the LotusSutra, because human senses are composed of "attachments" and "illusions". What looks like paper and ink to our senses is only what we "think" we see. We also see the birth and death of all things, whereas the Buddha says that this is an illusion. We see "self and others". The Buddha says this is an illusion. There is no "self" to "attain enlightenment". That's just how we perceive the flow of things. A gohonzon whose eyes are "opened" to the Lotus Sutra is inherently different from a gohonzon whose eyes are "opened" to the "offshoot" teachings of SGI/NST. In neither case is the gohonzon merely a "piece of paper", waiting to be "activated" by the chanting of practitioner. Such a prejudice would mean that the "flesh and blood" of a human being is somehow "superior" to the "paper and ink" of the gohonzon. This presupposes that the "matter" or material that constitutes the "outer wrapping" is the "true reality". A similar argument in the secular realm is the deep significance of the Constitution of the United States which transcends the paper and ink of which it is made.The Lotus Sutra teaches that there is only a partial "truth" to material reality. Material reality is an impermanent, constantly changing series of phenomenon.Life which is a synthesis of mind and body is both substantial and non-substantial. "Buddha-reality" too is neither "substantial" nor "non-substantial", but a "middle way" called "Chu". "Middle way" has two meanings in Buddhism. It refers to the superficial concept of "neither extreme" but it also means the deeper concept of "neither substantial or non-substantial". It is the ninth consciousness that cannot be perceived by the six senses or usual human reasonings. WE cannot put faith in any conclusions that are drawn by prejudices about material objects, be they made of flesh, crystal, paper or electrons. The "reality" is not confined or defined by the "material" we see. So, when making sweeping statements about the "gohonzon", the bottom line is, no one alive today can hazard a guess about what it is actually is. "Representation" is a rationalization, but it doesn't reflect the understanding of Nichiren Daishonin.. When we chant to a "Nichiren" gohonzon, we really don't know anything about what we're doing, just like the plant which follows the sun doesn't have any conscious understanding about what it's doing. When we chant to an SGI/NST gohonzon, we don't know what the "difference" is (given our unreliable "senses"). Why take a chance? Since it is all based on faith, why not take faith as Nichiren "recollected" it when he transcribed the gohonzon, exactly as he received it at the ceremony in the air. He explains, without equivocation, that he didn't "invent" the gohonzon but "received" from the Eternal Shakyamuni Buddha. Even in arguments about the "True Buddha", the glaring question is bypassed....What is a "Buddha" in the first place? IF that cannot be defined within the limitations of human senses, then what sense is there in saying that Nichiren is the "true" buddha and the Eternal Buddha Shakyamuni is a "cast-off" buddha (Taisekiji's theological term). It's a conclusion of profound ignorance, imputed by "interpretation". It's not based on Nichiren's own statements. It's the doctrine based on cryptic translations and interpretations by later priests of questionable intentions. We take Nichiren at his word, having faith that his Buddhism is "transmitted" directly from the Lotus Sutra, and that his "gohonzon" is not simply some "representation" but a "reality' that transcends the human senses and understanding. One does not "see" the ceremony in the air like one "sees" the skyline of New York nor should one dismiss the gohonzon as a mere "representation" of abstract Buddhist theory. Otherwise, why would Nichiren say that a "soul" inhabits the gohonzon, and that the orientation of an "object of worship" is the most important thing of all? It obviously is much more that it seems. It's not just ink on rice paper. There are 128 extant Nichiren gohonzons. They aren't just paper "manifestation" mandalas. Likewise, the so-called "dai-gonzon" is not just a "hunk of wood". It's much more sinister. It's a fake, so what "soul" imbues it? How could it be "the living Nichiren" when it renders "worthless" all authentic Nichiren gohonzons? 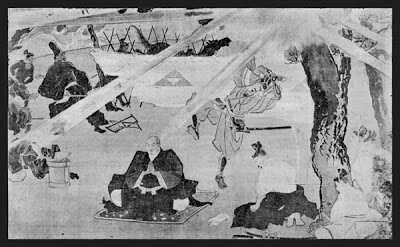 Nichiren said that ALL of the troubles of Japan stemmed from worshiping the wrong "gohonzon" and replacing the correct "gohonzon" with provisional teachings and their attendant "manifestations" (Buddhas, who are "emanations" of the Original Eternal Shakyamuni). These are statements that transcend the reach of human intelligence. Nichiren is telling us that there is MUCH more here than meets the eye. In fact, it transcends the eyes, ears, nose and mind.